The term empathogen, meaning "generating a state of empathy", was coined in 1983–84 independently by Ralph Metzner and David E. Nichols as a term to denote a therapeutic class of drugs that includes MDMA and phenethylamine relatives. Nichols later rejected this initial terminology and adopted, instead, the term entactogen, meaning "touching within", to denote this class of drugs, asserting a concern with the potential for improper association of the term empathogen with negative connotations related to the Greek root πάθος páthos ("suffering"). Additionally, Nichols wanted to avoid any association with the term pathogenesis. Nichols also thought the original term was limiting, and did not cover other therapeutic uses for the drugs that go beyond instilling feelings of empathy. The hybrid word entactogen is derived from the roots en (Greek: within), tactus (Latin: touch) and -gen (Greek: produce). Neither term is dominant in usage, and, despite their difference in connotation, they are essentially interchangeable, as they refer to precisely the same chemicals. Psychiatrists began using empathogens as psychotherapy tools in the 1970s despite the lack of clinical trials. In recent years, the scientific community has been revisiting the possible therapeutic uses of empathogens. Therapeutic models using MDMA have been studied because of its empathogenic properties. This type of therapy would be applicable for treating a patient who was experiencing psychological trauma such as PTSD. Traumatic memories can be linked to fear in the patients which makes engaging with these memories difficult. Administration of an empathogen such as MDMA allows the patient to disconnect from the fear associated with the traumatic memories and engage in therapy. 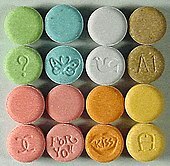 MDMA acts by targeting the body's stress response in order to cause this therapeutic effect. In addition to reducing anxiety and a conditioned fear response, MDMA also reduces the avoidance of feelings. Patients are then able to trust themselves and their therapist and engage with traumatic memories under the influence of MDMA. Although the therapeutic effects of empathogens may be promising, drugs such as MDMA have the potential for negative effects that are counter productive in a therapy setting. For example, MDMA may make negative cognition worse. This means that a positive experience is not a guarantee and can be contingent on aspects like the setting and the patient's expectations. Additionally there is no clear model of the psychopharmacological means for a positive or negative experience. There is also a potential concern for the neurotoxic effects of MDMA on the fiber density of serotonin neurons in the neocortex. High doses of MDMA may cause potential depletion of serotonergic axons. The same effects may not be caused by lower doses of MDMA required for treatment, however. ^ a b Nichols, D. (1986). "Differences Between the Mechanism of Action of MDMA, MBDB, and the Classic Hallucinogens. Identification of a New Therapeutic Class: Entactogens". Journal of Psychoactive Drugs. 18 (4): 305–13. doi:10.1080/02791072.1986.10472362. PMID 2880944. ^ a b Colman, Andrew M. (2015). Dictionary of Psychology - Oxford Reference. doi:10.1093/acref/9780199657681.001.0001. ISBN 9780199657681. ^ a b c Nichols, D; Yensen, R; Metzner, R; Shakespeare, W (1993). "The Great Entactogen - Empathogen Debate". Newsletter of the Multidisciplinary Association for Psychedelic Studies MAPS. 4 (2): 47–49. Retrieved 6 January 2015. ^ Metzner, Ralph (1993). "Letter from Ralph Metzner". Newsletter of the Multidisciplinary Association for Psychedelic Studies MAPS. 4 (1). Retrieved 8 January 2015. ^ a b Parrott, A. C. (2007-04-01). "The psychotherapeutic potential of MDMA (3,4-methylenedioxymethamphetamine): an evidence-based review". Psychopharmacology. 191 (2): 181–193. doi:10.1007/s00213-007-0703-5. ISSN 0033-3158. PMID 17297639.